Philip II (Spanish: Felipe II; 21 May 1527 – 13 September 1598) was King of Castile and Aragon [a] (1556–98), King of Portugal (1581–98, as Philip I, Filipe I),  King of Naples and Sicily (both from 1554), and jure uxoris King of England and Ireland (during his marriage to Queen Mary I from 1554 to 1558). He was also Duke of Milan. From 1555 he was lord of the Seventeen Provinces of the Netherlands. 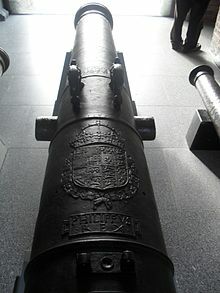 The son of Holy Roman Emperor and King of the Spanish kingdoms Charles V and Isabella of Portugal, Philip was called "Felipe el Prudente" ("Philip the Prudent") in the Spanish kingdoms; his empire included territories on every continent then known to Europeans, including his namesake the Philippines. During his reign, the Spanish kingdoms reached the height of its influence and power. This is sometimes called the Spanish Golden Age. The expression " the empire on which the sun never sets" was coined during Philip's time to reflect the extent of his dominion. Philip was described by the Venetian ambassador Paolo Fagolo in 1563 as "slight of stature and round-faced, with pale blue eyes, somewhat prominent lip, and pink skin, but his overall appearance is very attractive". The Ambassador went on to say "He dresses very tastefully, and everything that he does is courteous and gracious." 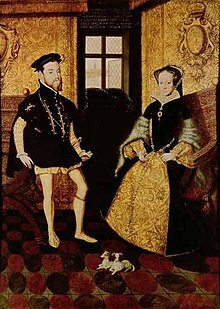 Besides Mary I, Philip was married three other times and widowed four times. Philip carried several titles as heir to the Spanish kingdoms and empire, including Prince of Asturias. 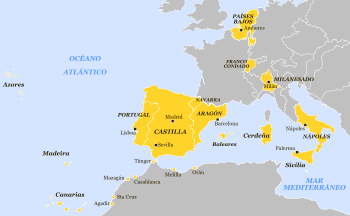 The newest constituent kingdom in the empire was Navarre, a realm invaded by Ferdinand II of Aragon mainly with Castilian troops (1512), and annexed to Castile with an ambiguous status (1513). War across Navarre continued until 1528 ( Treaties of Madrid and Cambrai). 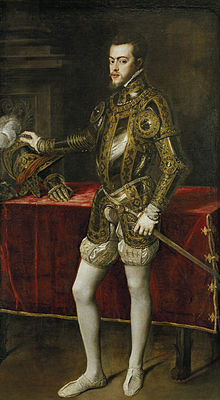 Charles V proposed to end hostilities with King Henry II of Navarre—the legitimate monarch of Navarre—by marrying his son Philip to the heiress of Navarre, Jeanne III of Navarre. The marriage would provide a dynastic solution to instability in Navarre, making him king of all Navarre and prince of independent Béarn, as well as lord of a large part of southern France. However, the French nobility under Francis I opposed the arrangement and successfully ended the prospects of marriage between the heirs of Habsburg and Albret in 1541. Spanish culture flourished during Philip's reign, beginning the " Spanish Golden Age", creating a lasting legacy in literature, music, and the visual arts. One of the notable artists from Phillip II's court was Sofonisba Anguissola, who gained fame for her talent and unusual role as a woman artist. She was invited to the court of Madrid in 1559 and was chosen to become an attendant to Isabella Clara Eugenia (1566–1633). Anguissola also became a lady-in-waiting and court painter for the queen, Elizabeth de Valois. During her time as a court painter, Anguissola painted many official portraits of the royal family, a sharp departure from her previous personal portraits. Philip's foreign policies were determined by a combination of Catholic fervour and dynastic objectives. He considered himself the chief defender of Catholic Europe, both against the Ottoman Turks and against the forces of the Protestant Reformation. He never relented from his fight against heresy, defending the Catholic faith and limiting freedom of worship within his territories. These territories included his patrimony in the Netherlands, where Protestantism had taken deep root. Following the Revolt of the Netherlands in 1568, Philip waged a campaign against Dutch heresy and secession. It also dragged in the English and the French at times and expanded into the German Rhineland with the Cologne War. This series of conflicts lasted for the rest of his life. Philip's constant involvement in European wars took a significant toll on the treasury and caused economic difficulties for the Crown and even bankruptcies. Charles V abdicated the throne of Naples to Philip on 25 July 1554, and the young king was invested with the kingdom (officially called "Naples and Sicily") on 2 October by Pope Julius III. The date of Charles' abdication of the throne of Sicily is uncertain, but Philip was invested with this kingdom (officially "Sicily and Jerusalem") on 18 November 1554 by Julius. In 1556, Philip decided to invade the Papal States and temporarily held territory there, perhaps in response to Pope Paul IV's anti-Spanish outlook. According to Philip II, he was doing it for the benefit of the Church. Philip led the Spanish kingdoms into the final phase of the Italian Wars. The Spanish army decisively defeated the French at St. Quentin in 1557 and at Gravelines in 1558. The resulting Treaty of Cateau-Cambresis in 1559 secured Piedmont, Savoy, and Corsica for the Spanish allied states, the Duchy of Savoy, and the Republic of Genoa. France recognised Spanish control over the Franche-Comté, but, more importantly, the treaty also confirmed the direct control of Philip over Milan, Naples, Sicily, Sardinia, and the State of Presidi, and indirectly (through his dominance of the rulers of Tuscany, Genoa, and other minor states) of all Italy[ citation needed]. The Pope was a natural Spanish ally[ citation needed]. 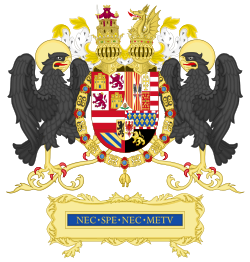 The only truly independent entities on Italian soil were the allied Duchy of Savoy and the Republic of Venice. Aragonese control of Italy would last until the early eighteenth century. Ultimately, the treaty ended the 60-year, Franco-Spanish wars for supremacy in Italy. Philip's rule in the Seventeen Provinces known collectively as the Netherlands faced many difficulties, leading to open warfare in 1568. He appointed Margaret of Parma as Governor of the Netherlands, when he left the low countries for the Spanish kingdoms in 1559, but forced her to adjust policy to the advice of Cardinal Granvelle, who was greatly disliked in the Netherlands, after he insisted on direct control over events in the Netherlands despite being over two weeks' ride away in Madrid. There was discontent in the Netherlands about Philip's taxation demands and the incessant persecution of Protestants. In 1566, Protestant preachers sparked anti-clerical riots known as the Iconoclast Fury; in response to growing Protestant influence, the army of the Iron Duke ( Fernando Álvarez de Toledo, 3rd Duke of Alba) went on the offensive, further alienating the local aristocracy. There were massacres of civilians in Mechelen,  Naarden,  Zutphen  and Haarlem. In 1572 a prominent exiled member of the Dutch aristocracy, William the Silent (Prince of Orange), invaded the Netherlands with a Protestant army, but he only succeeded in holding two provinces, Holland and Zeeland. Rampant inflation and the loss of treasure fleets from the New World prevented the crown from paying its soldiers consistently, leading to the so-called Spanish Fury at Antwerp in 1576, where soldiers ran amuck through the streets, burning more than 1,000 homes and killing 6,000 citizens. On January 31, 1578, the Spanish drove the Dutch patriots out of Namur and then pursued vigorously. At Gembloux, the retreating rear guard was taken in the flank and routed. The main Netherlands force was then assaulted by the Spaniards and destroyed. In return for no more than 12 men slain, the Spanish killed or captured as many as 8,000. In 1578 young king Sebastian of Portugal died at the Battle of Alcácer Quibir without descendants, triggering a succession crisis. His granduncle, the elderly Cardinal Henry, succeeded him as king, but Henry also had no descendants, having taken holy orders. When Henry died two years after Sebastian's disappearance, three grandchildren of Manuel I claimed the throne: Infanta Catarina, Duchess of Braganza, António, Prior of Crato, and Philip II of Spain. António was acclaimed King of Portugal in many cities and towns throughout the country, but members of the Council of Governors of Portugal who had supported Philip escaped to the Spanish kingdoms and declared him to be the legal successor of Henry. Philip II then marched into Portugal and defeated Prior António's troops in the Battle of Alcântara. The troops commanded by Fernando Álvarez de Toledo the 3rd Duke of Alba  imposed subjection to Philip before entering Lisbon, where he seized an immense treasure. 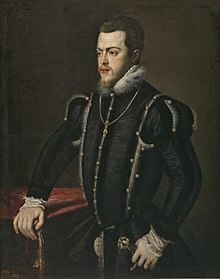 Philip II of Spain was crowned Philip I of Portugal in 1581 (recognized as king by the Portuguese Cortes of Tomar) and a near sixty-year personal union under the rule of the Philippine Dynasty began. This gave Philip control of the extensive Portuguese empire. When Philip left for Madrid in 1583, he made his nephew Albert of Austria his viceroy in Lisbon. In Madrid he established a Council of Portugal to advise him on Portuguese affairs, giving prominent positions to Portuguese nobles in the Spanish courts, and allowing Portugal to maintain autonomous law, currency, and government. This is on the well-established pattern of rule by councils. Acts making it high treason to deny Philip's royal authority were passed in Ireland  and England. Philip and Mary appeared on coins together, with a single crown suspended between them as a symbol of joint reign. The Great Seal shows Philip and Mary seated on thrones, holding the crown together. 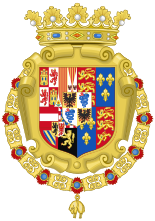 The coat of arms of England was impaled with Philip's to denote their joint reign. During their joint reign, they waged war against France, which resulted in the loss of Calais, England's last remaining possession in France. Philip's wife had succeeded to the Kingdom of Ireland, but the title of King of Ireland had been created in 1542 by Henry VIII after he was excommunicated, and so it was not recognised by Catholic monarchs. In 1555, Pope Paul IV rectified this by issuing a papal bull recognising Philip and Mary as rightful King and Queen of Ireland. King's County and Philipstown in Ireland were named after Philip as King of Ireland in 1556. The couple's joint royal style after Philip ascended the Spanish throne in 1556 was: Philip and Mary, by the Grace of God King and Queen of England, Spain, France, Jerusalem, both the Sicilies and Ireland, Defenders of the Faith, Archdukes of Austria, Dukes of Burgundy, Milan and Brabant, Counts of Habsburg, Flanders and Tirol. 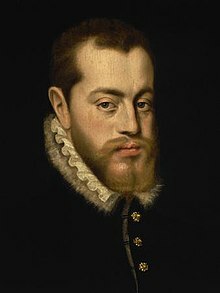 Philip II died in El Escorial, near Madrid, on 13 September 1598, of cancer. He was succeeded by his 20-year-old son, Philip III. Statue of Philip II at the Sabatini Gardens in Madrid ( F. Castro, 1753). Philip II's reign can hardly be characterised by its failures. He ended French Valois ambitions in Italy and brought about the Habsburg ascendency in Europe. He commenced settlements in the Philippines, which were named after him, [b] and established the first trans-Pacific trade route between America and Asia. He secured the Portuguese kingdom and empire. He succeeded in increasing the importation of silver in the face of English, Dutch, and French privateers, overcoming multiple financial crises and consolidating Spain's overseas empire. Although clashes would be ongoing, he ended the major threat posed to Europe by the Ottoman navy. King of Castile, of León, of Granada, of Toledo, of Galicia, of Seville, of Cordoba, of Murcia, of Jaen, of the Algarves, of Algeciras, of Gibraltar, of the Canary Islands, of the Indias, the Islands and Mainland of the Ocean Sea. [c] Lord of Molina. 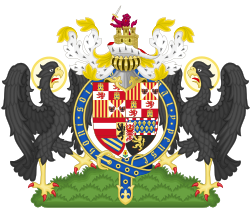 Philip continued his father's style of " Majesty" (Latin: Maiestas; Spanish: Majestad) in preference to that of " Highness" (Celsitudo; Alteza). In diplomatic texts, he continued the use of the title " Most Catholic" (Rex Catholicismus; Rey Católico) first bestowed by Pope Alexander VI on Ferdinand and Isabella in 1496. 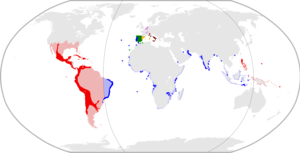 ^ " Treaty of Joinville". (in French) In Davenport, Frances G. European Treaties Bearing on the History of the United States and Its Dependencies. The Lawbook Exchange, Ltd., 2004. ^ See, inter alia, " Amberes Archived 3 February 2012 at the Wayback Machine" (in Spanish) and Standard Catalog of World Gold Coins. ^ Cremades, Checa. Felipe II. Op. cit. in " The Place of Tudor England". Transactions of the Royal Historical Society, 6th Series, Vol. 12. Cambridge Univ. Press, 2003. ISBN 0521815614.